Temperature data loggers help ensure heat comfort levels are maintained and help verify operation of boiler plant and controls. The Energy Logger is used to monitor electrical consumption before and after energy saving measures are introduced. Tinytag data loggers are helping the University of Chichester with their energy saving objectives. Peter Bassett is the University's Energy Officer, and his role is to implement energy saving measures and initiatives in order to reduce carbon emissions. Monitoring is essential to ensure heat comfort levels are maintained, and to verify the operation of boiler plant and controls. In addition, monitoring provides evidence to support future projects, and verification post project. 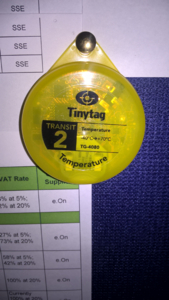 Tinytag Transit 2 data loggers are used to confirm temperatures within accommodation and academic areas. People's perception of temperature frequently varies: if they feel the radiator and it's not on, they may think the heating is broken - when in reality the room has reached a satisfactory comfort level and the heating has shut down. The Transit 2 is ideal for measuring a wide range of temperatures, potentially over a significant amount of time. Peter frequently has six or seven simultaneously monitoring different buildings across the campuses. The Energy Logger is used to verify electrical consumption pre and post energy saving measures/projects to calculate actual carbon and financial savings. The data is analysed and used as evidence to confirm that the University is either in control of its energy usage, or to highlight areas for potential improvement. Peter comments, "The software that accompanies the loggers produces comprehensive graphs that can easily be exported into 3rd party software. Gemini's customer support has been very good: queries have been answered in a timely manner at all times."